Products: FOODSAFE PMO FG-100, FOODSAFE PR FG-15, FOODSAFE PR FG-150, FOODSAFE PR FG-220, H-1, Semi-Synthetic Blend and Fully Synthetic. FOOD GRADE PROOFER CHAIN LUBE FG-100 has been formulated for lubrication in high humidity environments and room temperature chain applications. This specially formulated lubricant contains an optimized combination of anti-wear agents, rust inhibitors and polymeric viscosity improvers. FOOD GRADE PROOFER CHAIN LUBE FG-100 provides outstanding performance advantages over conventional mineral oils. It has been designed to provide extremely high performance on bakery proofer chains and other food-processing equipment in humid environments. PR FG-150 lubricant is specially formulated for conveyor roller ball bearings, rack and pin/roller chains inside high humid Proofer Boxes at bakeries and food processing plants where incidental contact with food may occur. Apply via automatic applicator, manually or best method. Adjust your lubrication cycles to take advantage of PR’s reduced lubrication consumption. NSF H-1 registered, meets USDA 1998 H-1 guidelines and is suitable for applications in which incidental contact with the product may occur. Complies with Title 21 CFR Section 178.350 FDA requirements. 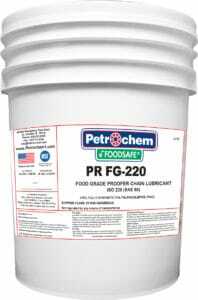 PR FG-220 lubricant is specially formulated for conveyor roller ball bearings, rack and pin/roller chains inside high humid Proofer Boxes at bakeries and food processing plants where incidental contact with food may occur. Apply via automatic applicator, manually or best method. Adjust your lubrication cycles to take advantage of PR’s reduced lubrication consumption.